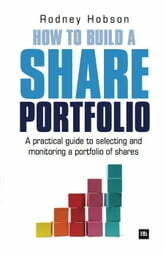 Effective share portfolios for the private investor Running an efficient portfolio of shares means buying and selling the shares that make the most sense for you, and at the right time and price. Rodney Hobson, author of the bestselling Shares Made Simple, sets out how to do this without having to be a financial expert or full-time trader. Using plain language, he takes the reader simply and logically through the process, giving helpful examples and real-life case studies at every turn. In How to Build a Share Portfolio you can: - find out how to determine the right objectives for your portfolio - learn how to pick shares that fulfill your investment ambitions, and when to drop those that no longer do so - understand how best to set your portfolio's size and ensure it is diversified against risk - discover the best ways of monitoring your portfolio, and of reducing losses and rebalancing it when necessary. Anyone who is thinking of investing, however much or however little, will benefit from the information, advice and guidance contained in this book. Similarly, those who already have a portfolio will find it helps them to stand back and reassess whether they are making the most of their money and whether their portfolio is meeting their needs.